The Rod Glove Rod Wrapz is a great accessory for anglers that need to carry their fishing rods to and from the water. For many anglers, we usually own a few rod and reel combos for different techniques. Unless you store all of your rods in your boat, chances are you will be carrying them along with your tackle bag to and from either shore or to a boat as a co-angler. If you are co-angler tournament angling, you will want to be prepared with your rods rigged and ready for a day on the water. Keeping your rods organized and tangle free is important and the Rod Glove Wrapz make it easy to transport them from shore to a boat. Rod Glove Wrapz are made from stretchable neoprene so you can bundle your rods snuggly and securely and each package contains a 15" strap for the bottom and a 10" strap for the top. 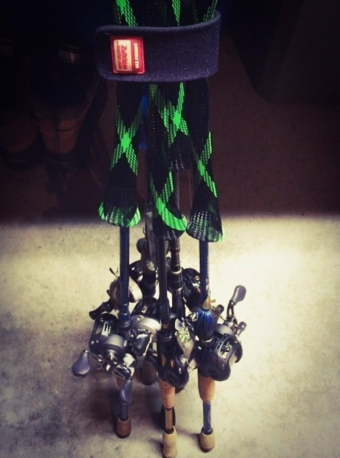 Whether you are heading out to hit the humps or the banks, be sure to take the Rod Glove Wrapz along to keep your rods bundled.